The cargo vessel Uruguay Reefer was abandoned in South Atlantic after uncontrolled water ingress. The vessel, which was loaded with a cargo of frozen squid and krill, collided with unidentified floating ice and suffered underwater breaches. The Master of Uruguay Reefer decided to alter course to Falkland Islands and reported the accident the local authorities. The crew tried to pump out the water from the flooded compartments, but unfortunately the attempts were not enough successful and the reefer carrier started losing seaworthiness. The bad weather and heavy seas additionally worsen the situation and put the crew in danger. 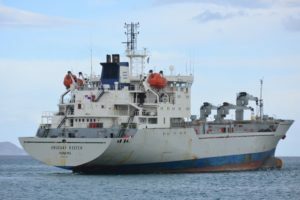 The cargo ships Taganrogskiy Zaliv and Frio Las Palmas responded to the distress signal and tried to assist the damaged reefer freighter, but the bad weather did not allowed attaching of a towing line. All the 42 crew were safely evacuated to cargo ship Taganrogskiy Zaliv without reported injuries. Meanwhile, the ship Frio Las Palmas remained at the scene of the drifting reefer cargo vessel in Southwest Atlantic. According to latest information the ship Uruguay Reefer is sinking with bow partially submerged. The local authorities initiated investigation for the root cause of the accident. There is not information about injuries and water pollution. The cargo vessel Uruguay Reefer (IMO: 9017264) has overall length of 150.30 m, moulded beam of 22.60 m and maximum draft of 10.10 m. The deadweight of the ship is 10,587 DWT and the gross tonnage is 10,629 GRT.